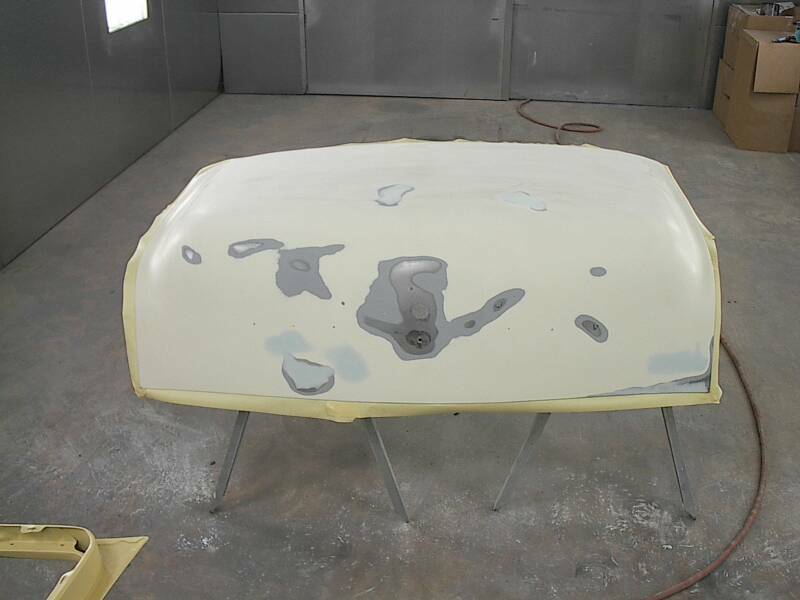 The quarter panel receives some filler and sanding to get an eveness necessary to receive the primer coat. 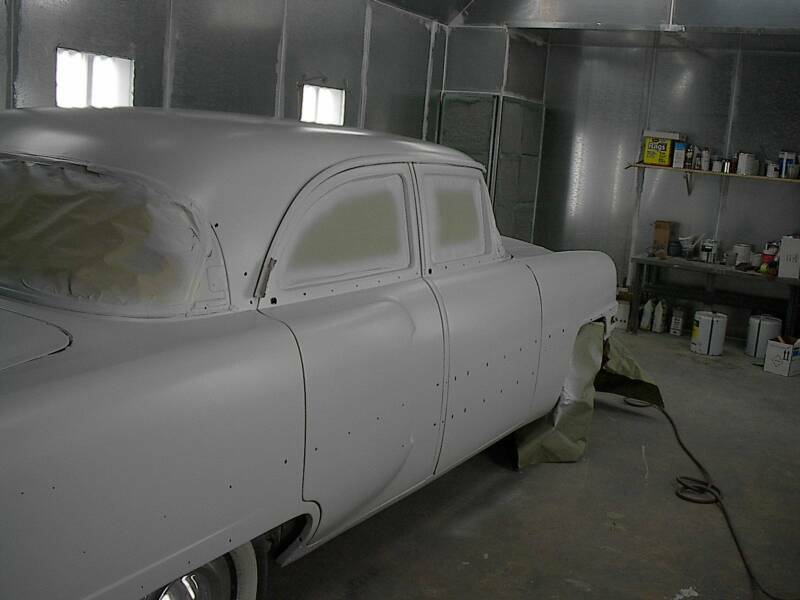 After the entire body has been gone over in this same fashion, the car rolls into the paint booth to get shot with primer. 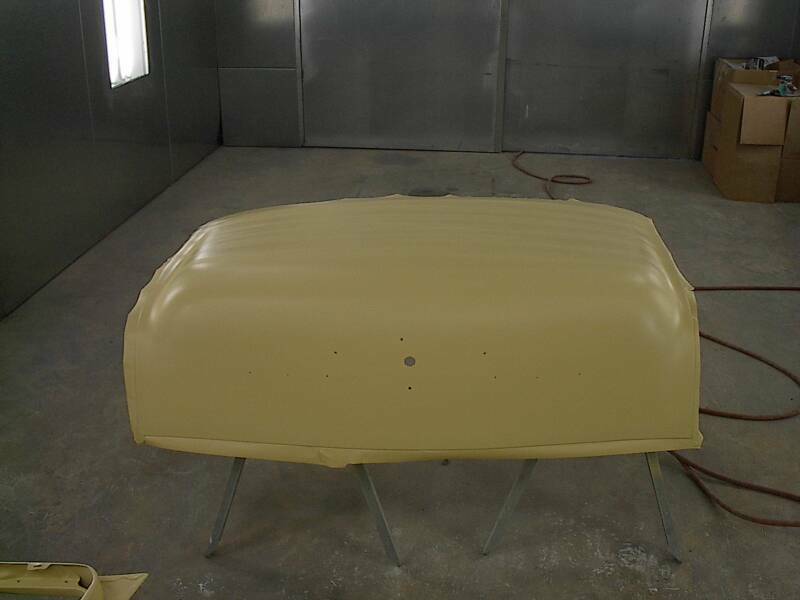 A shot of the doors and deck lid getting pre-paint preparation and smoothing before being put into primer. 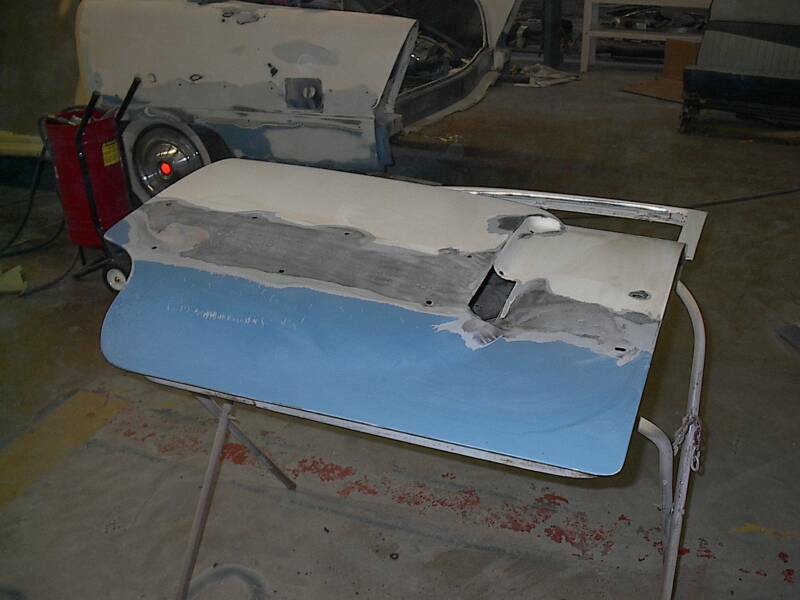 Each of the four doors the deck lid and the hood have now been shot with primer and are ready to go into final paint after some fine tuning. 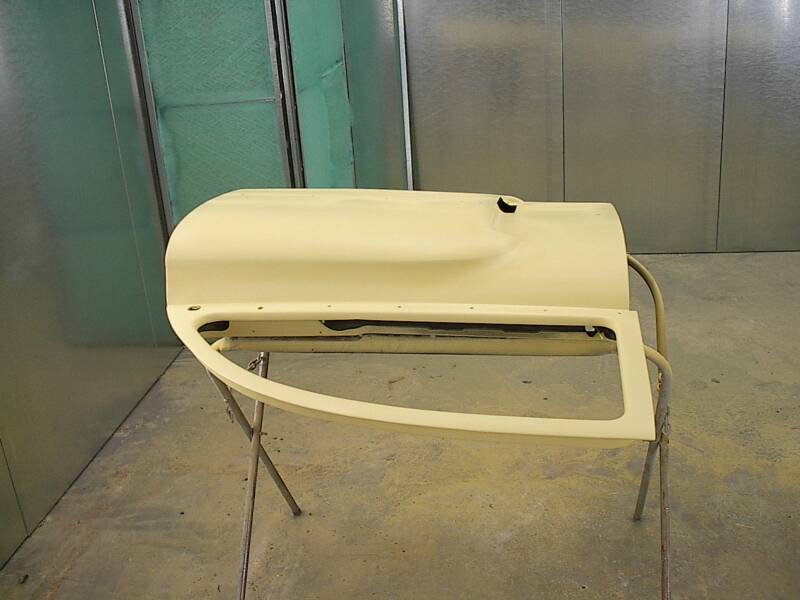 Jamming is an important step in the repaint process where the edges of the doors, deck and fenders by the hood get an extra coat of paint prior to shooting the whole car. 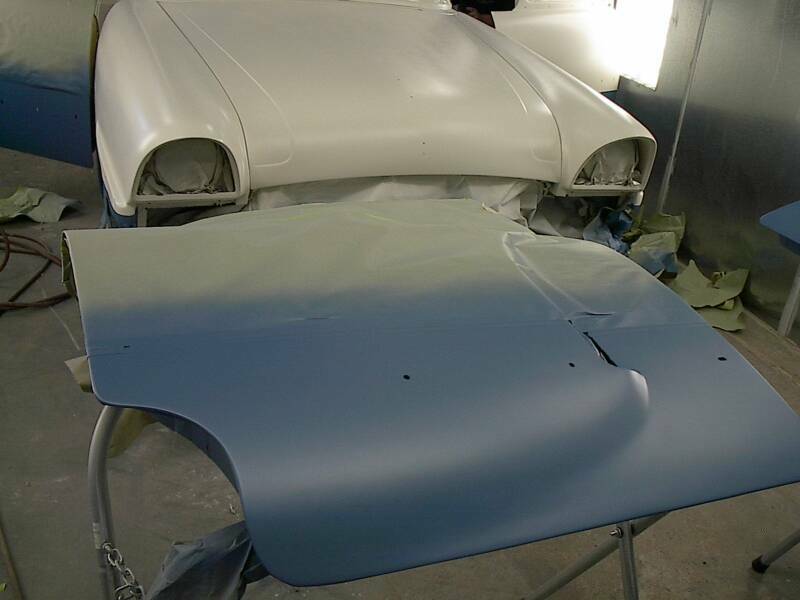 Now the car is in primer, the doors have since been fitted to the car as well as the deck lid. 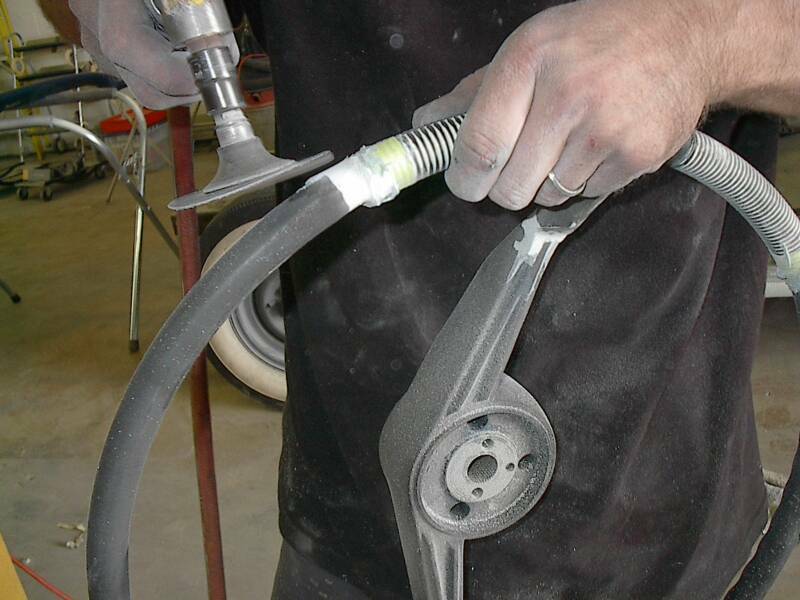 Currently the dashpad is being installed and the steering column is being reassembled after having been painted. Next the dash was attacked. 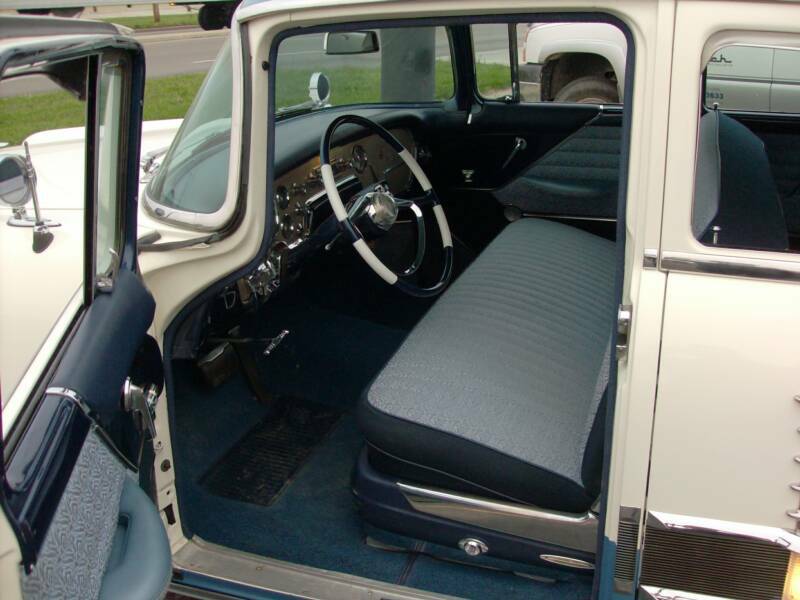 The pad was sent to the upholsterer, the wheel was reconditioned in house and the dash pieces were painted. 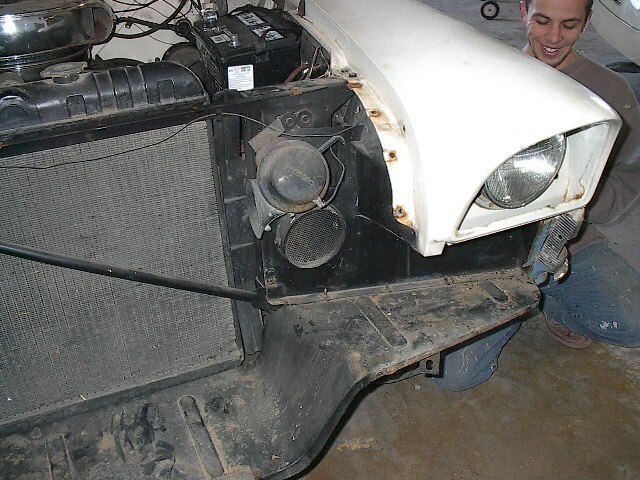 Clockwise from top left we see shots of the dash prior to disassembly, two shots of Mitch grinding down the fill to match the original size of the wheel and a shot of the interior dash pieces painted in place. We started out with a really great car. 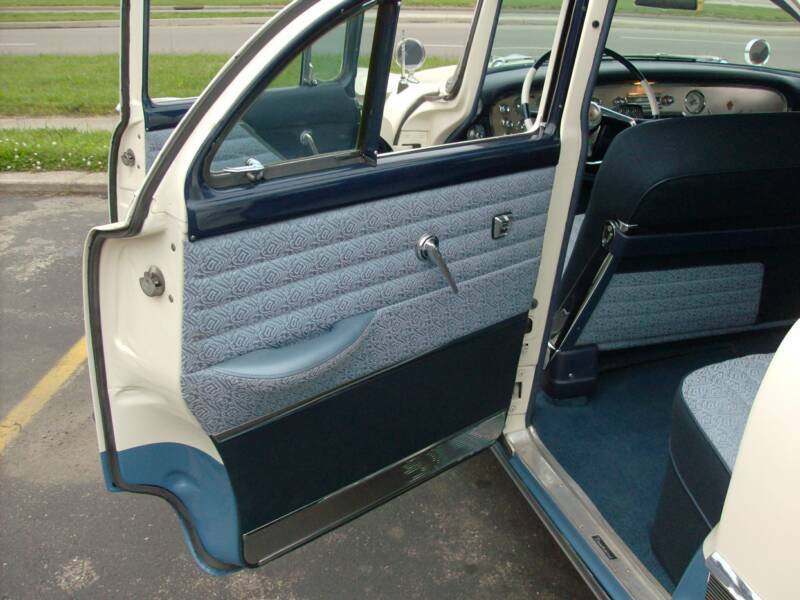 This car runs about as smoothly as any. 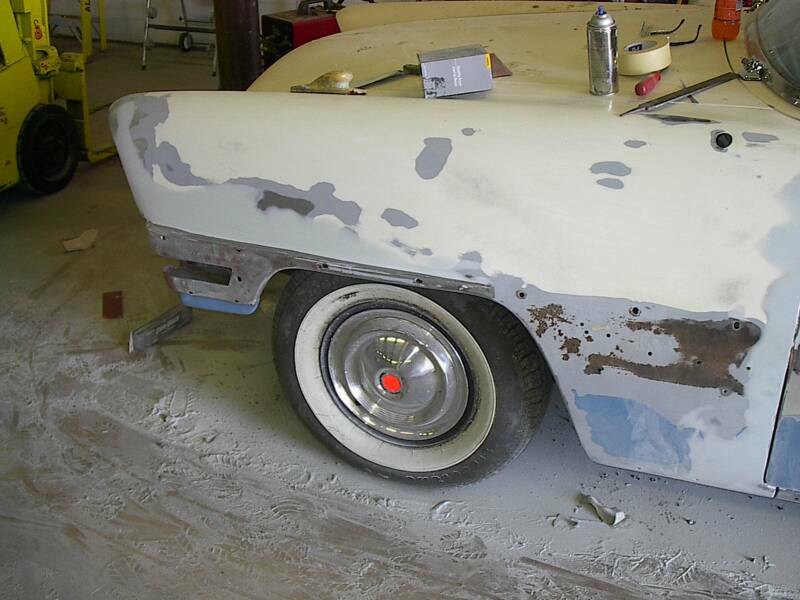 Almost no body work to do. Simply had to take it down far enough to paint it, and reupholster. 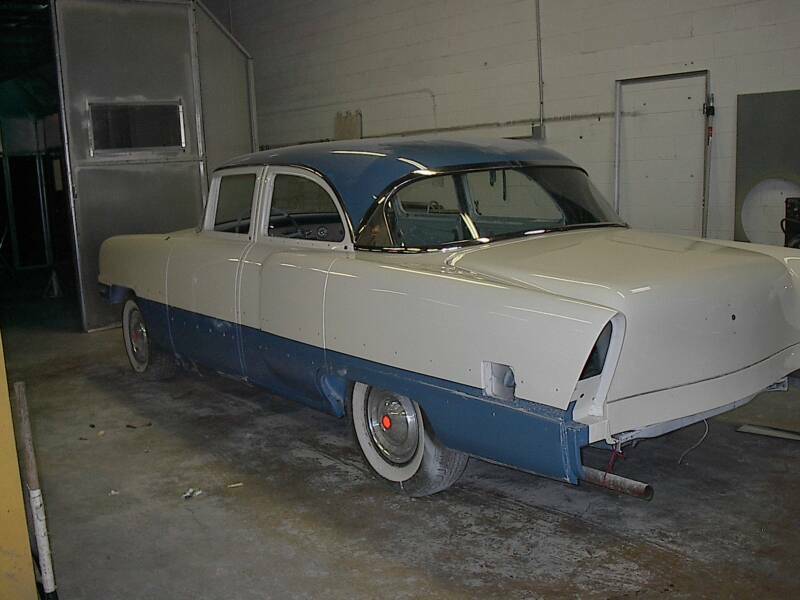 A really great example of the solid construction of the 1956 Patrician. 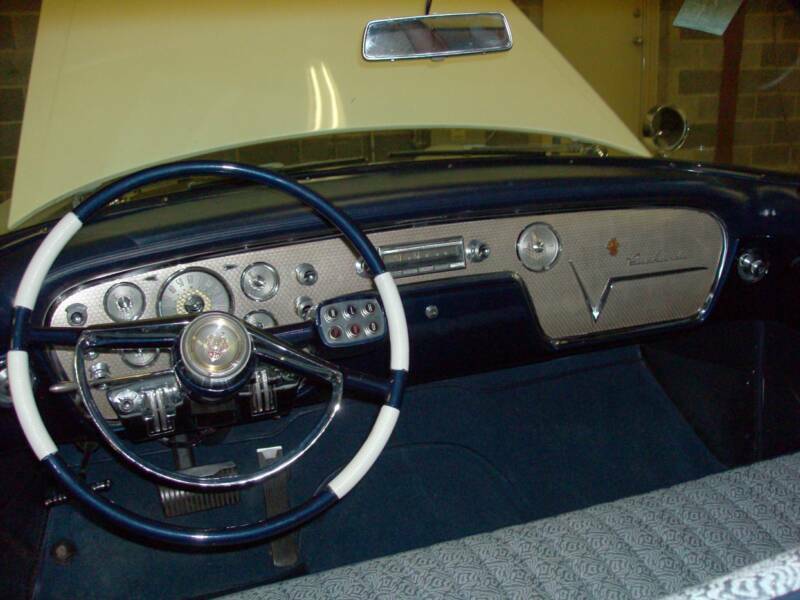 Imagine driving around town or blasting down the highway to your favorite getaway. This car will get you there. 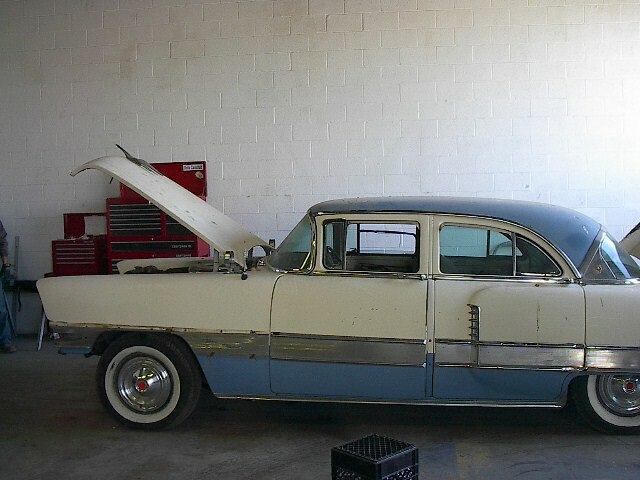 A complete car. Some people would be happy to just drive it around the way it was before we started. 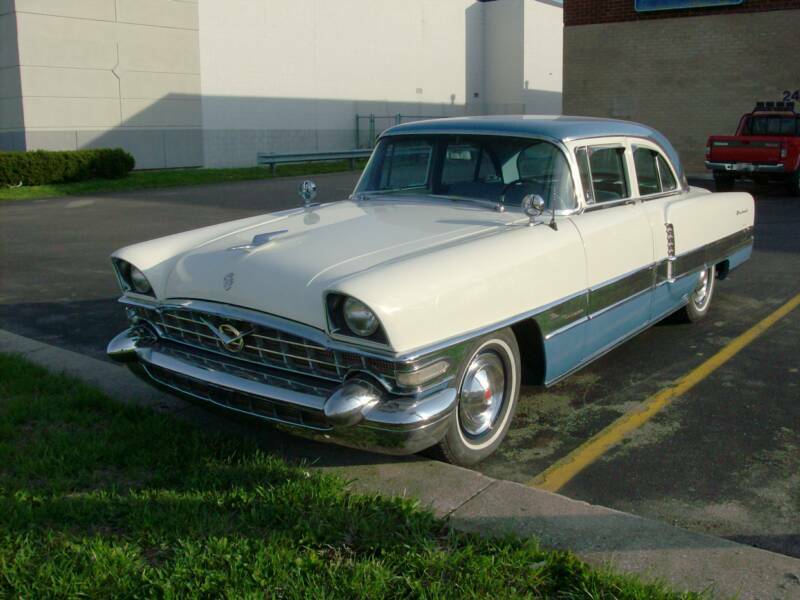 This is a Packard, a symbol of status for its day and it deserves more than just so so, it deserves its former glory. 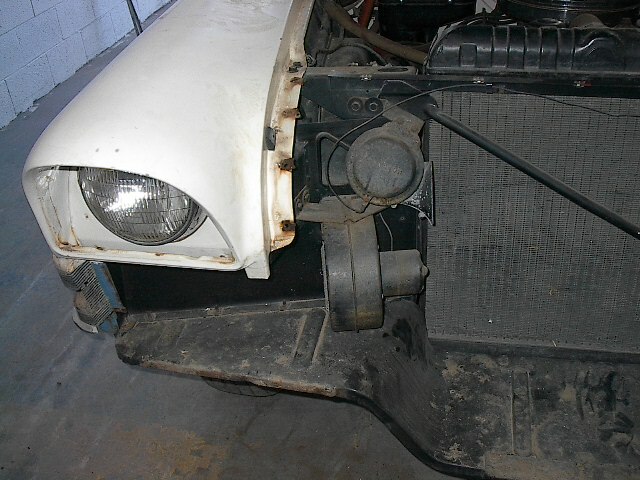 Here at Aldrich Restoration Specialists we take it where it needs to go...wait til you see it on the road. 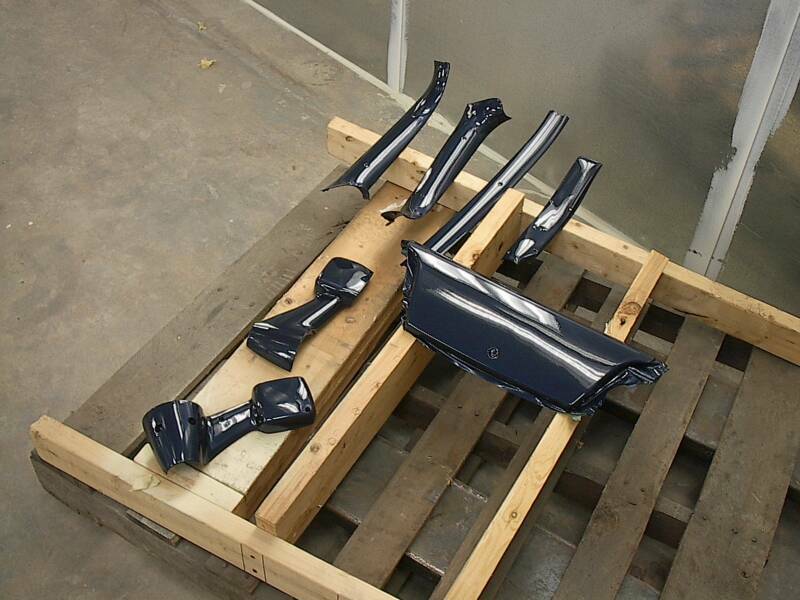 Interior trim pieces get their final coat of paint and are ready to go back into the car. 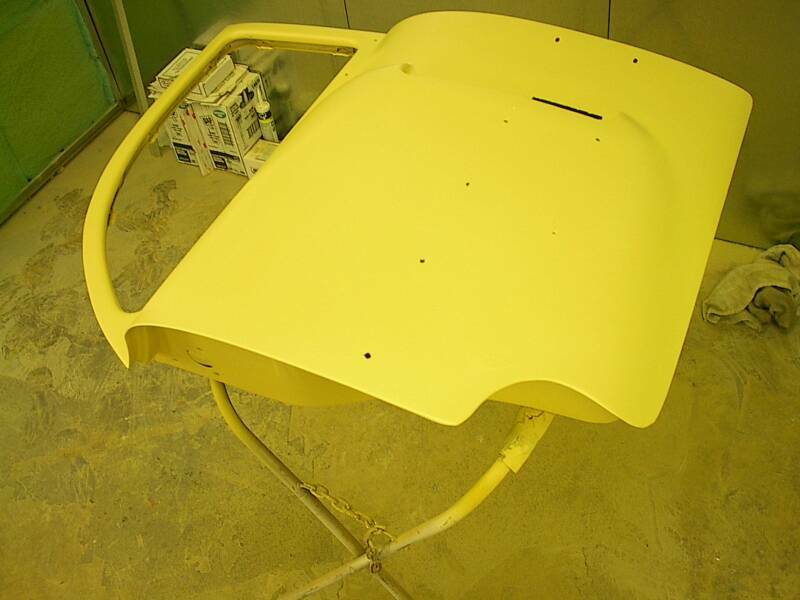 Interior window trim pieces get their final coat of paint prior to reinstallation. 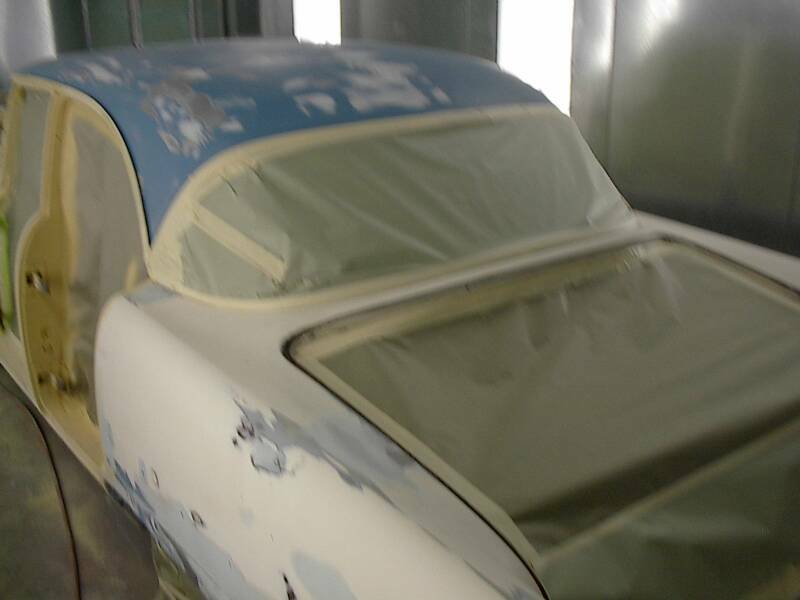 The paper and tape are then removed and the car is re-masked to put on the blue. 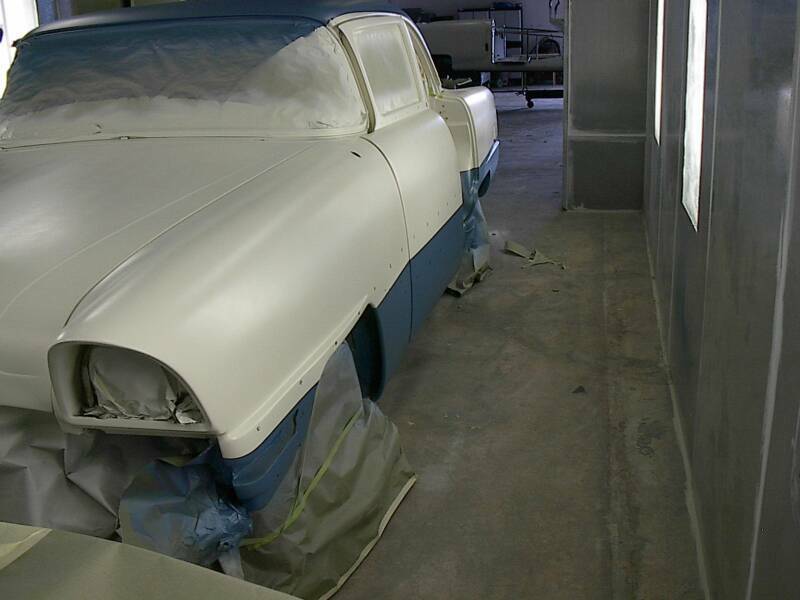 This picture does not do the pristine clean line between the blue and the white any justice. 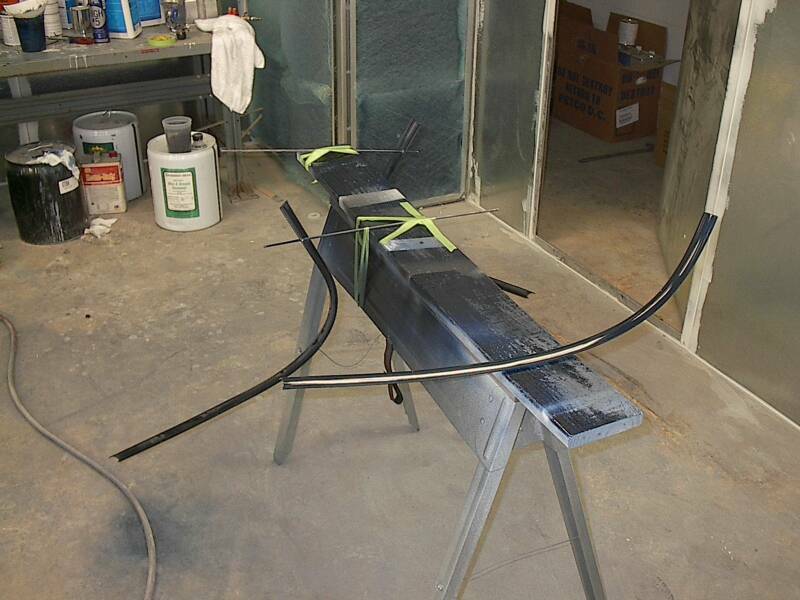 It does not really matter anyway because a large piece of trim will cover the division. 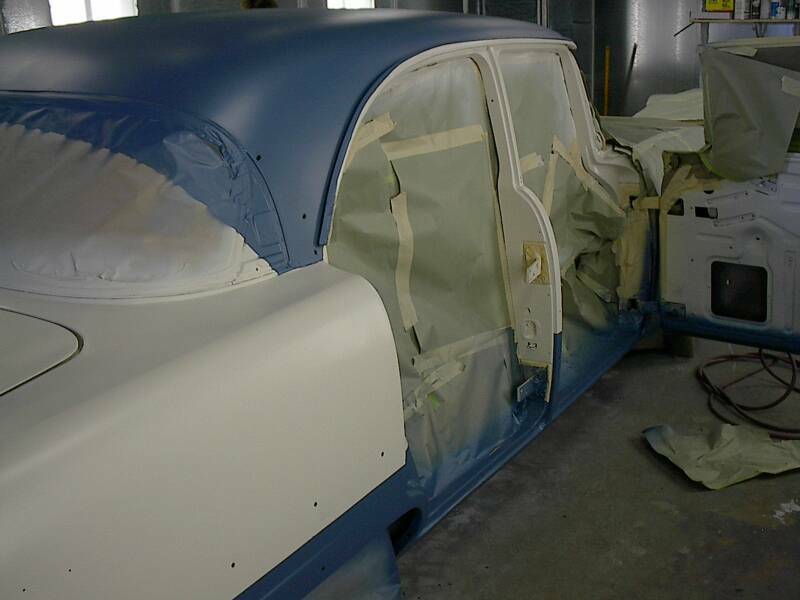 After the car gets sealed, it takes on its first layer of color. In this case correct is Dover White. 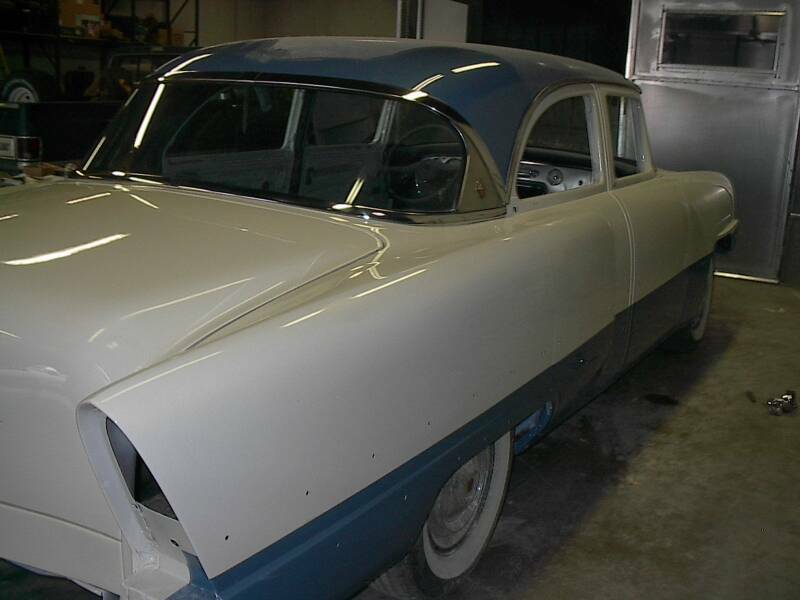 Looking back, here is the car before any work is done to it. 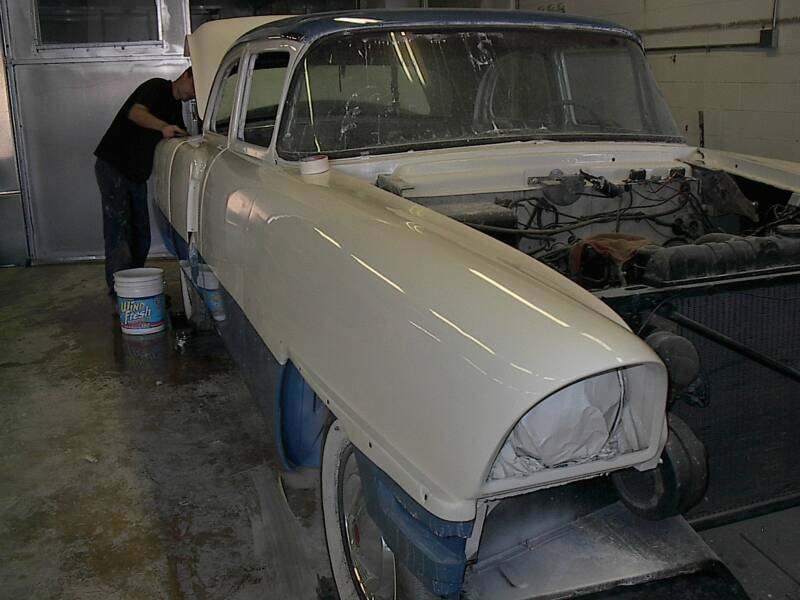 This week it seemed like a good time to go from start to finish on the paint. 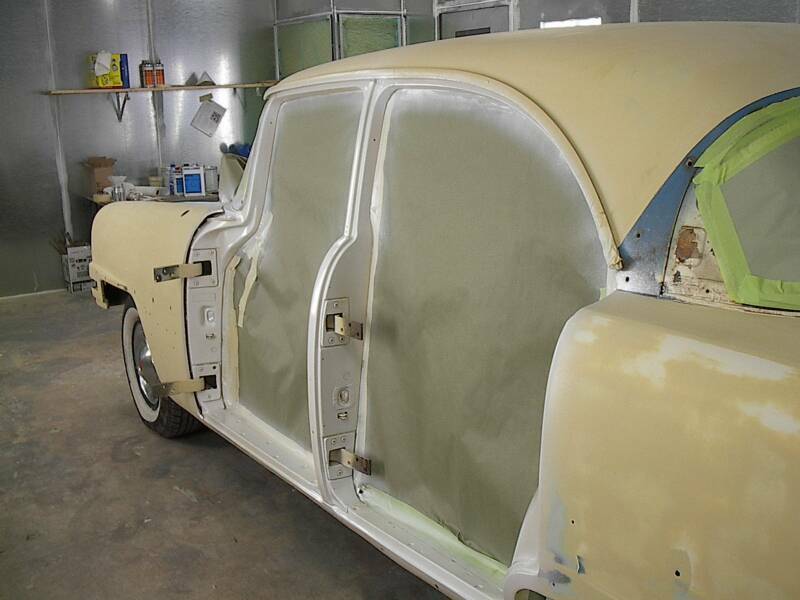 Plus these four pictures of this door show the process of sanding down, feathering in, priming up masking off and spraying on final color. 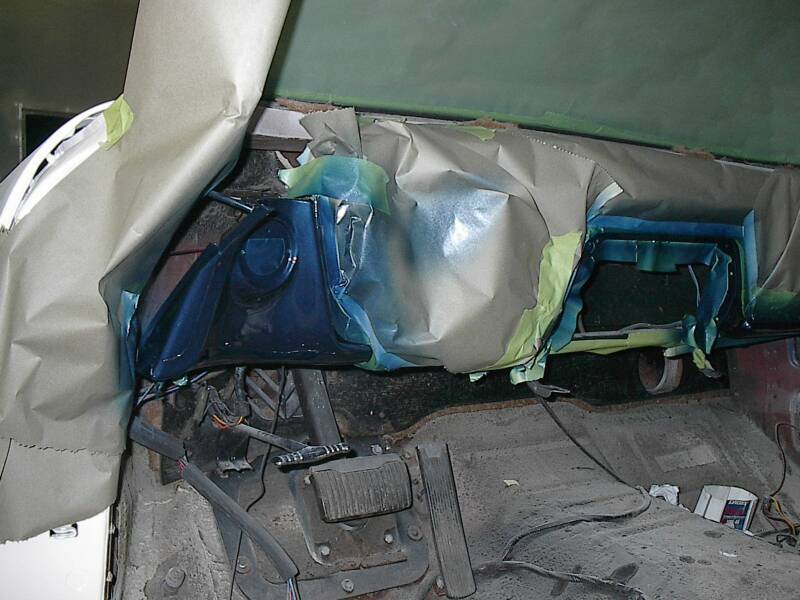 Here is the car on July 17th, 2006. 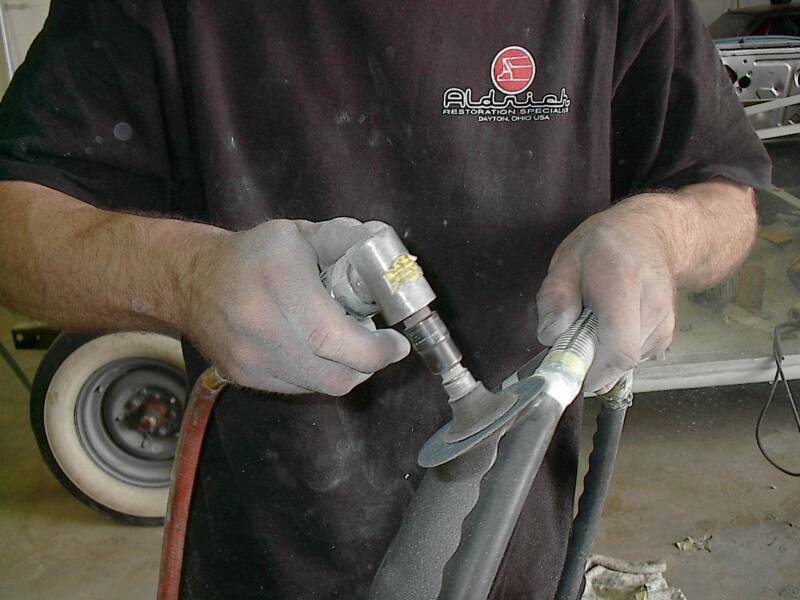 Mitch is steadily wet sanding and preparing the car for buffing. 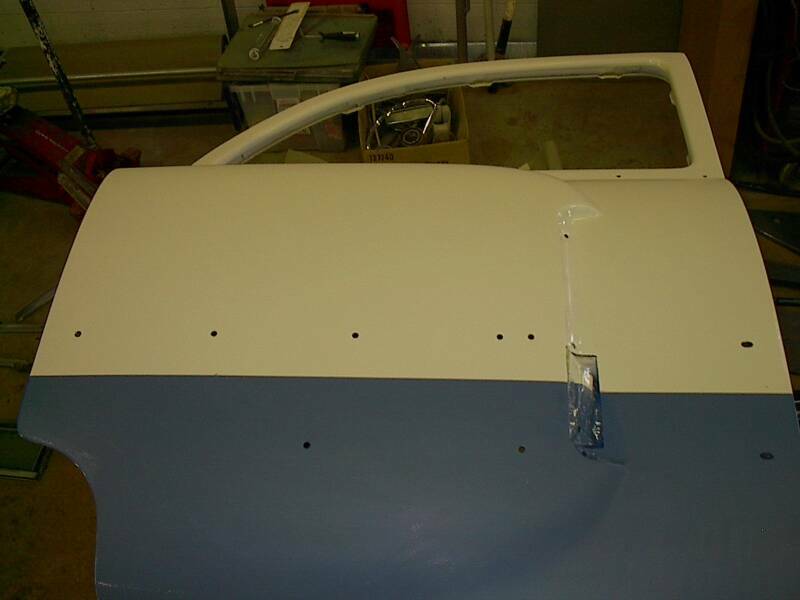 The rear window and door top trim goes on the car including new old stock emblems for the rear corner. 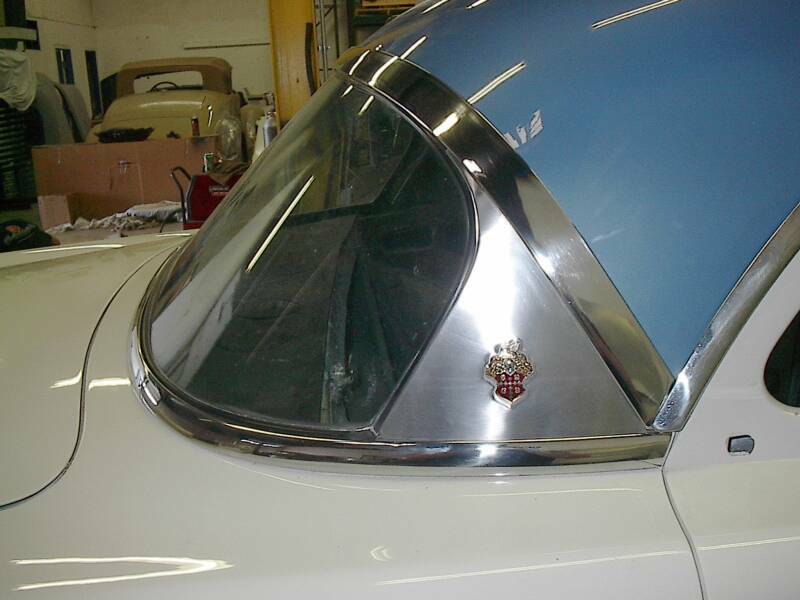 Here is a view of the other side rear window trim and rear corner Packard Crest badge. 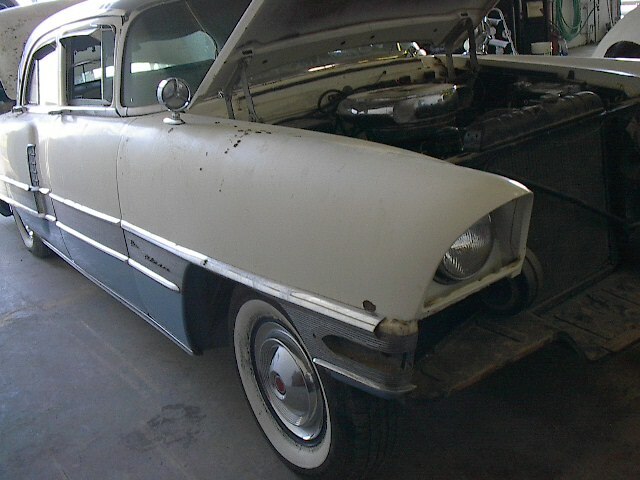 A close up shot of the Packard Crest. These are new old stock. We are considering attempting to remake some old crests where the paint has fallen out or been cooked out by the sun. Perhaps that would be easier than tracking down ones that are intact like these. Under the hood shot. This car floats down the road with plenty of horsepower to keep up with the modern day hustle! 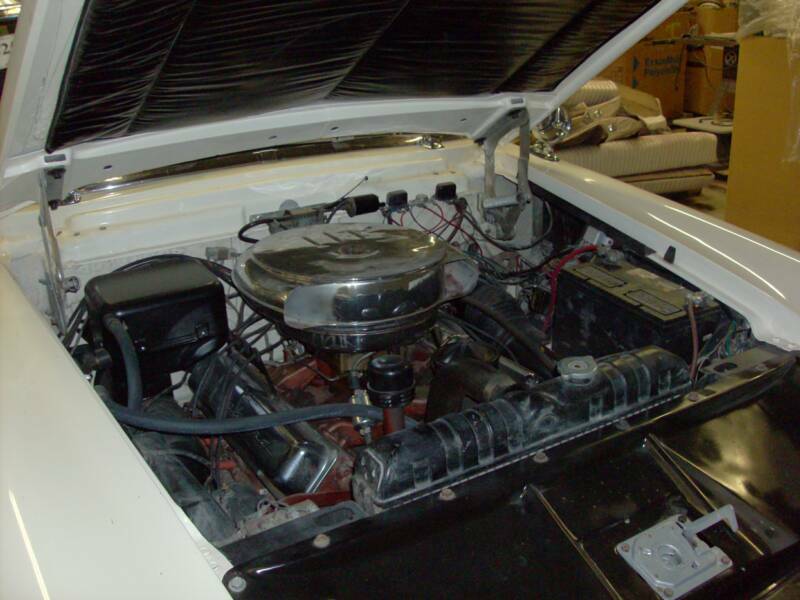 This shot shows the orignal Packard engine compartment but with a new hood liner. The beautiful new trunk liner. 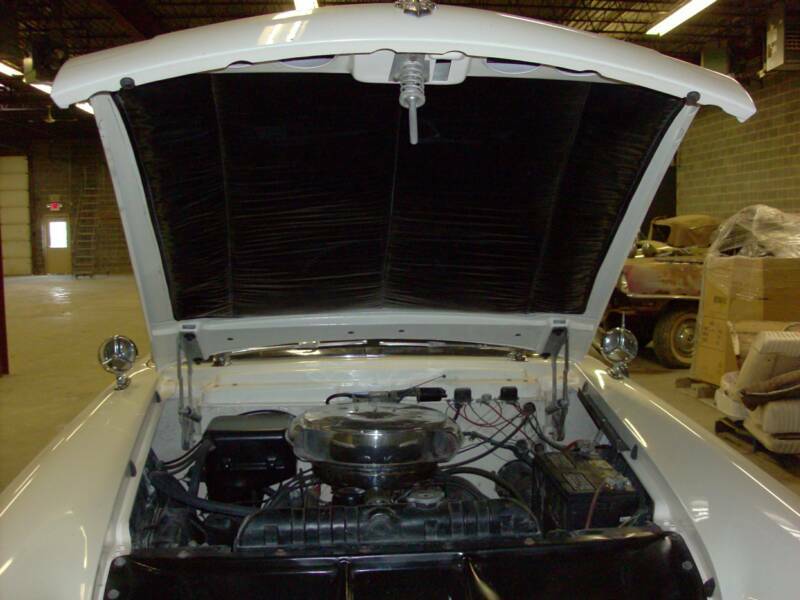 We had to work very hard to find material for this car that matched the originals from this car. 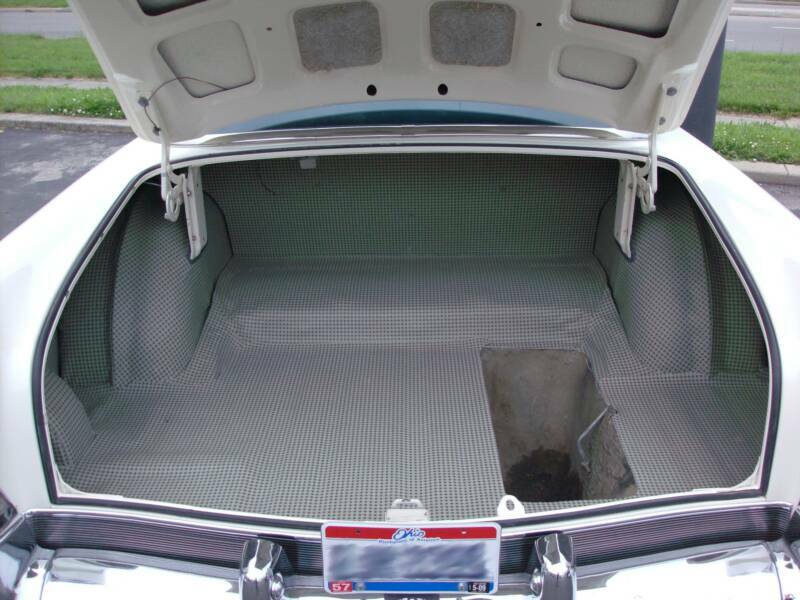 And the trunk liner was no exception. We did find the right fabric for it and is as close to original as you can get! 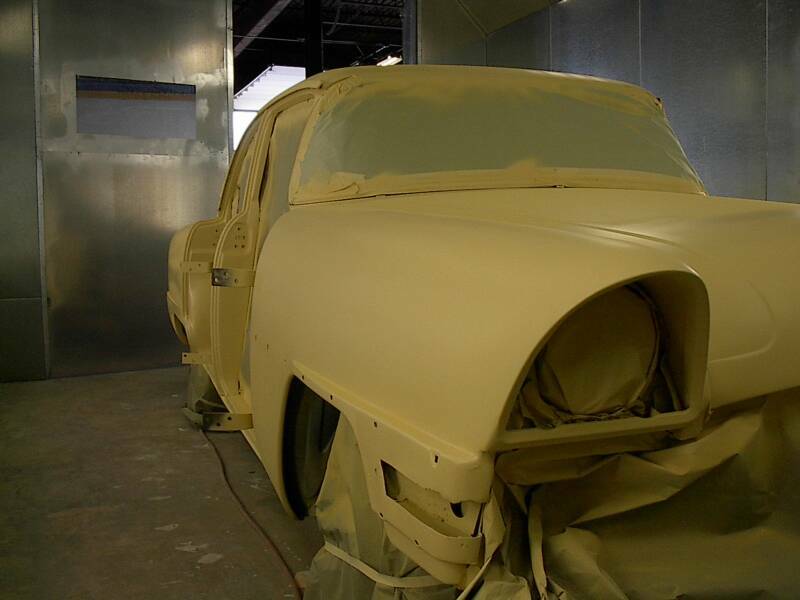 Another picture of the gorgeous new paint. Front view under florescent lights, beautiful straight Packard. The dash! Its a work of art for sure!! 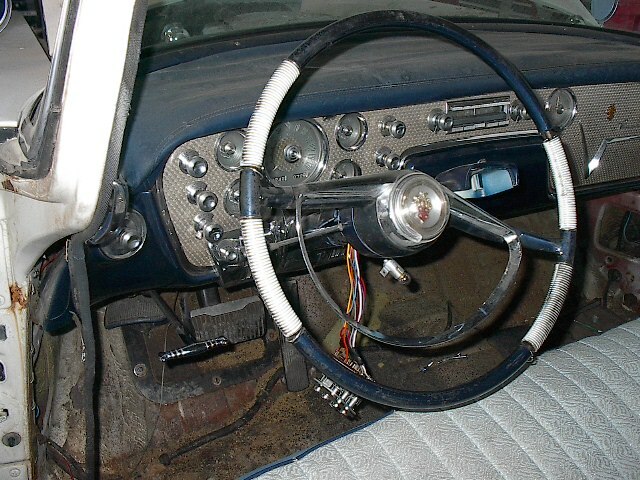 Here is the awesome interior and front dash for this car...Don't-cha just wanna take it for a spin? 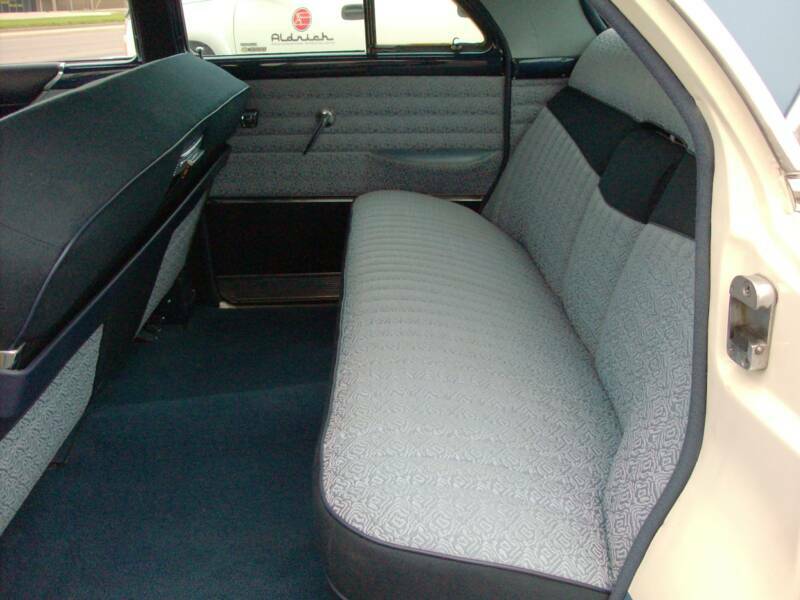 Here is the backseat with its spacious leg room! 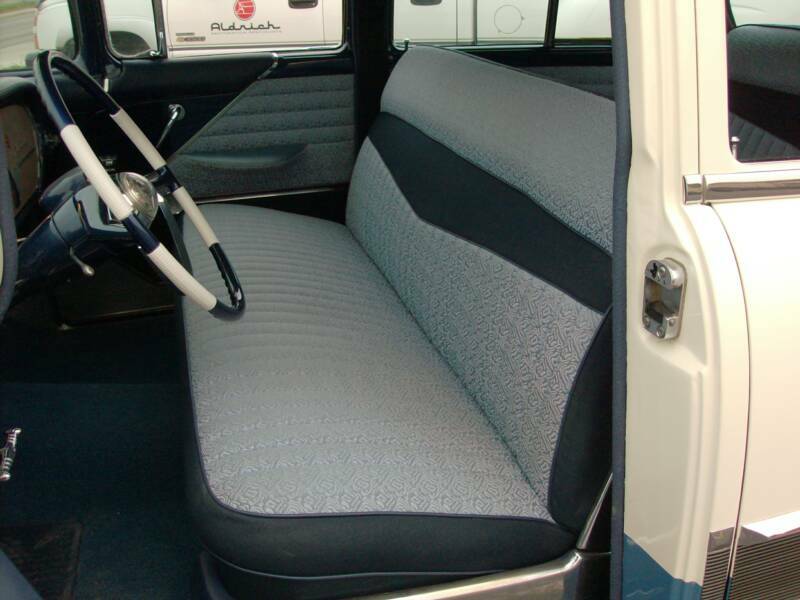 The backseat is very inviting with brand new carpet, seats, and headliner. 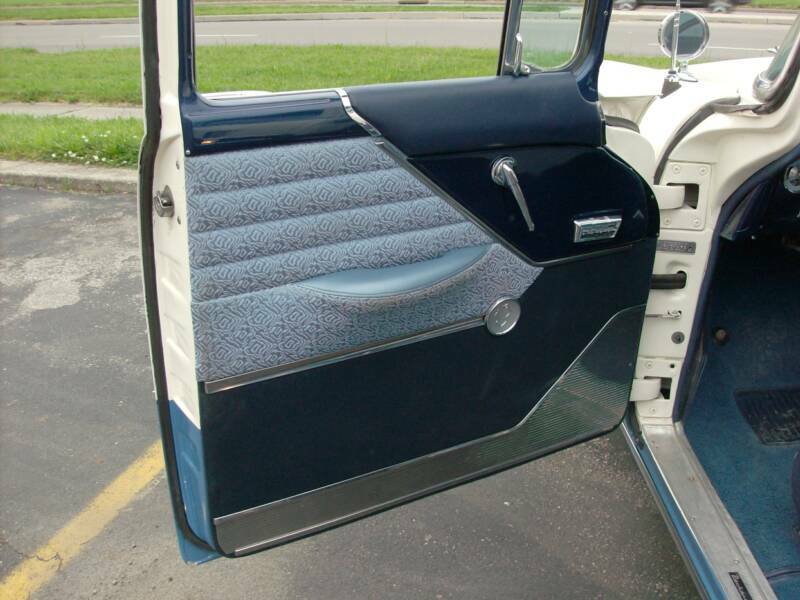 The new door panel with correct brocade cloth in a beautiful powder blue. Another beautiful picture of the new interior. Up close you can see the detail involved with this brocade fabric. 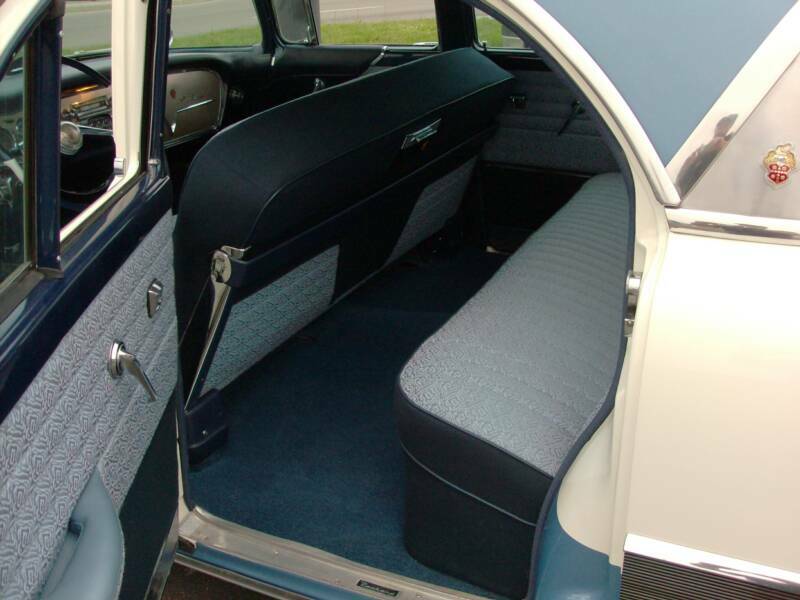 This car has power windows also! The midnight blue contrasts beautfully with the light blue. 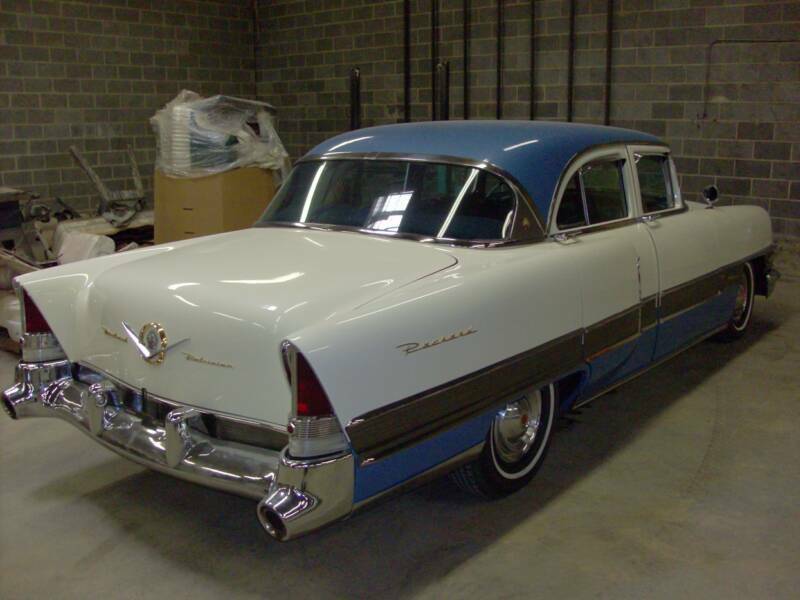 This 1956 Packard Patrician sits for her own special photo shoot. 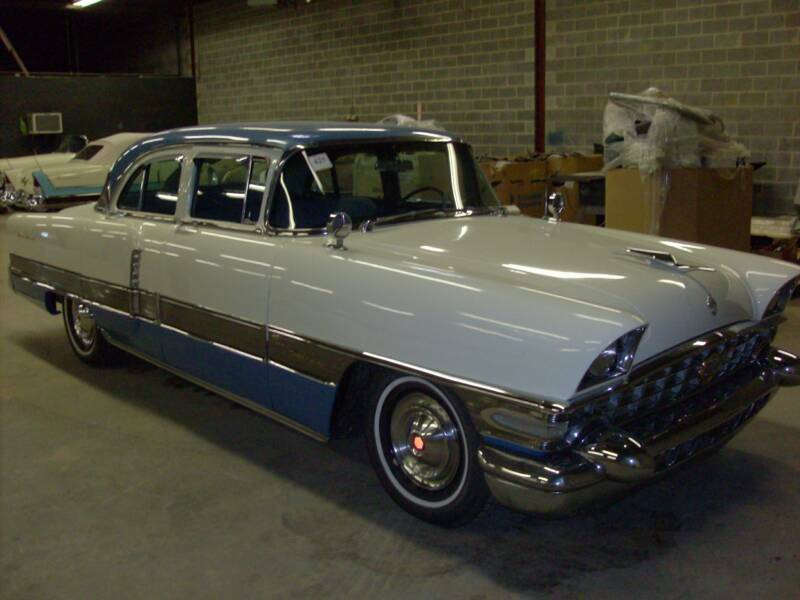 This car is 100% Packard Original, Push button Ultramatic Transmission, 374ci engine, new two toned paint in the orginal colors, entirely new interior with the correct brocade fabric and trunkliner.